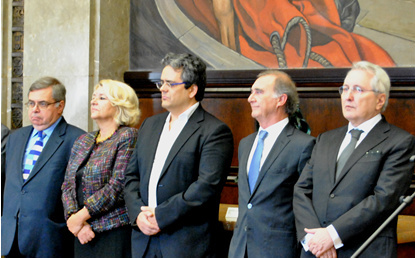 On 14 December 2017, the President, the Vice President and three members of the Board of the Entidade Reguladora para a Comunicação Social, the Portuguese Regulatory Authority for the Media, took office in front of the President of the Parliament. The term of the previous Board had expired in November 2016, but owing to lack of consensus between political parties in Parliament to reach the required two-thirds majority, it took a year to appoint of the new members. Mr Sebastião Póvoas, the new President, is a distinguished lawyer with a long judicial career, pursued notably in Macau. He was also a Legal Adviser at Portugal’s Permanent Mission to the United Nations (2002/2006) in New York, and Head of the Portuguese Delegation of the International Seabed Authority in Kingston. He was appointed to the Supreme Court of Justice in 2002, where he was Supreme Court Judge and President of the First Section. In 2013, he was elected as Vice-President of the Supreme Court of Justice. The other Board members all have different backgrounds: Fátima Resende, a member of ERC predecessor the High Authority for Social Communication from 1995 to 2002, has been ERC's Executive Director from 2012 to 2017, Francisco Azevedo e Silva is a journalist, João Pedro Figueiredo a lawyer and Vice-President Mário Mesquita a University Professor. The Regulatory Board, responsible for defining and implementing ERC's regulatory activity, comprises the Chairperson, the Vice-Chairperson and three board members. Four of the five members of the regulatory board are elected by the Parliament by a majority of two thirds of the deputies and the fifth member is co-opted by the previously elected four. The Chairman and the Vice-Chairman are elected from amongst the five members of the board.